Step right up and enjoy the fun! Lots of excitement, a great day out for everyone! 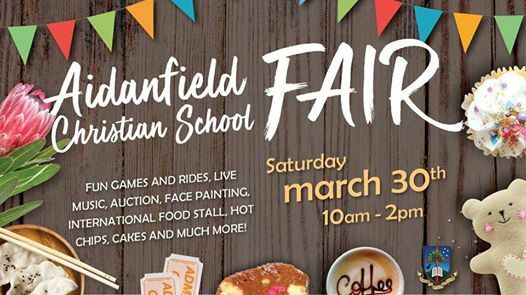 The Aidanfield Christian School Fair 2019 will be held on Saturday 30th March from 10:00 – 2:00 pm with great stalls, games and rides for the kids, family entertainment and lots of yummy food! Let the Games Begin! 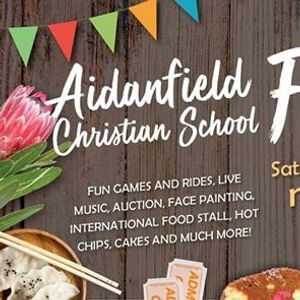 - Try your hand at a variety of 'New' and traditional fair games to WIN fabulous prizes – also don’t forget to pick a Mystery Bottle who knows what you will get?! Don't miss out on the bouncy castles and rides! The Market Place – A variety of exciting Market Stalls, White Elephant, Books, Toys, Near New Clothing!! There is something for EVERYONE!!! Oh Wonderful Food! – We have the Kiwi Classics, the good old Sausage Sizzle, Hot Chips, Spit Roast, Candy Floss, Snow Cones and not to be missed our amazing International Café with a delicious variety of food from many cultures. Yum! Live Music, Entertainment and a Live and Silent Auction! Not to be missed! Have fun and support your local community! See you there! This event is a fundraiser for our School. We are looking for potential Stall holders/Businesses who would be interested in having a stall at the event. You'll find all the details in the form on this event page, which needs to be completed by those interested. We would love to hear from you. 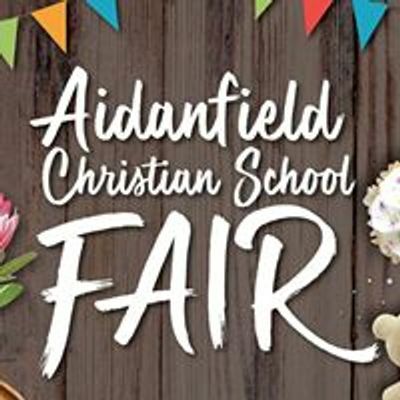 Also if you are interested in being a sponsor at our School Fair and would like to provide an item for our Live or Silent Auction we will in return advertise your business on our facebook page, school website and newsletters to! To contact us send us a Facebook Message.